Rutting action varies greatly from south to north across the North America. The birth of fawns has a lot to do with the timing of the whitetail breeding period across the continent. The reasons why this is the case may surprise you. There are abundant theories about the timing of the rut. In some years, it seems like the rut breaks loose all at once, and in other years, hunters will say it’s a “trickle rut” because they do not see the intense rutting activity. Books have been written about the impact of moon phase on the breeding activity, and some hunters are religious about planning their hunts around the correct moon phase for what they believe will be the best activity periods for bucks rutting. Several studies on the movements of radio collared and GPS tracked deer have cast considerable doubt on any theory that links the moon to rutting activity. In fact when you finish reading this, I think you will see that there is very little room for impact of moon phase on rutting activity. The key to when the deer need to breed has everything to do with when the fawns will be born. 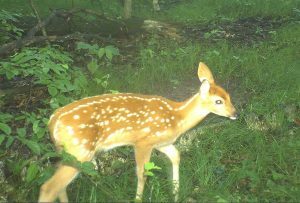 In the northern half of the US, the vast majority of whitetail fawns will be born during the month of May. This is very important to the survival of the species. In the southern reaches of the whitetail’s range, you can see evidence of rutting activity in late October and November much like you do in the north, but you will also see the majority of the breeding take place during December and even into January in many areas. This has everything to do with the milder winters. A fawn born during July in Texas or Florida for example has a pretty good chance of making it to adulthood. No so in Minnesota where I’m from. In Minnesota or Maine or any of the Canadian provinces, a fawn would only be three months old when the first cold, snowy weather sets in for the winter. Their chances of making it through that first blizzard in November are pretty slim. However, a fawn born in May will have the body size needed and will have the time to grow the necessary coat of guard hair and put on the fat needed to tough it out through that first winter. If you graphed out the rut, you would see that the breeding activity in the south takes place over a long curve and the peak is not as noticeable. Does may be bred any time from November through January. In the Canadian provinces, the peak of the rut is very pronounced and the vast majority of the breeding takes place over a two- to three-week period. In fact there is about one week each year when the bucks are going bonkers and the does are getting bred in a chaotic melee of rutting activity. The timing of the northern rut necessarily must take place over a short period of time in the fall, so the fawns will be born in a short period of time in the spring. Snowstorms in the north are common in April, and cold nights take their toll on tiny little fawns. Any fawns born while the nighttime temperatures are falling well below freezing have high mortality rates. Getting a foot of snow dumped on a newborn fawn is often a death sentence. So how do the deer know this? The rut is entirely controlled by photoperiodism. The length of daylight hours triggers the pituitary gland to release hormones and prepare the deers’ bodies for breeding. tetails live, there will be 20 hours of daylight at the day’s longest point in June, and there may be 18 hours of dark in the deepest parts of winter. That’s a dramatic change to take place over just a few months. On average, it is changing 8-10 minutes per day. In the southern parts of the whitetail’s range, the changes are not so dramatic. Days aren’t so short in the winter and nights aren’t so short in the summer. A change of a minute or two a day is enough to get from one end of the spectrum to the other. These radical changes in daylight hours dramatically affect the pituitary glands in the northern deer so the rut comes on fast and furious and then it’s over just as fast. So when someone talks about moon phase, weather or any other influences over rutting behavior, we know that these factors are very minor if they have any affect at all. Those positions become very difficult to defend in the light of the importance of the timing of fawning. The rut in the south can be quite drawn out, but in the north, it must be compressed into a very short window of opportunity; the health and survival of the spring-born fawns dictate it. I HAVE LIVED ON MY PROPERTY SINCE 1979 AND FOR MUCH OF THAT TIME THERE HAS BEEN SEVERAL DEER BASICALLY LIVING ON MY PLACE. 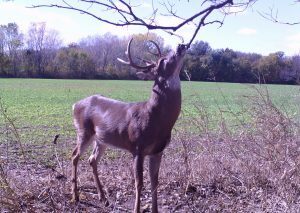 USUALLY IN LATE SUMMER (END OF JULY THRU AUGUST) I SEE SOME BUCKS BEGINNING TO SHOW ANTLERS. AS SEPTEMBER COMES THE BUCKS GET MORE SCARCE AND THE DOES STICK AROUND. NEVER HAVE SEEN ANY RUT ACTIVITY BUT YOU CAN ALMOST SET YOUR CLOCK WHEN IT COMES TIME FOR FAWNS TO BEGIN SHOWING UP. AROUND THE MIDDLE OF MAY EVERY YEAR ONE DOE IN PARTICULAR SHOWS UP WITH A FAWN (SOMETIMES TWINS) MOST OF THE FAWNS SHOW UP FROM THE MIDDLE OF MAY INTO THE FIRST OF JULY. i ACTUALLY HAD ONE DOE YEARS AGO GIVE BIRTH IN THE MIDDLE OF MY DRIVE WAY NO MORE THAN FIFTY YARDS FROM MY HOUSE. UNFORTUNATELY SOME LESS THAN ETHICAL FOLKS MOVED IN AND HAVE DECIMATED MY DEER HERD SO THERE IS ALMOST NO DEER AROUND NOW BUT ONE DEPENDABLE DOE DROPPED IN WITH A FAWN ABOUT A WEEK AND A HALF AGO. USED TO BE LIKE A FAWN DAY CARE ON MY FIVE ACRES. THE DOES WOULD HIDE THEM ALL OVER MY PLACE FOR THE DAY AND PICK THEM UP AROUND FOUR THIRTY EVERY AFTERNOON. GUESS THEY FELT SAFE HERE.